Many believe the Revolutionary War began with The Shot Heart ‘Round The World. However, that just marked the organized military portion of a war that had been ensuing for years. Parliament had enacted the Molasses Act in 1733, yet it was rarely enforced. After the war, they passed a modified version commonly referred to as the Sugar Act of 1764, in order to pay the war debt. It was designed to collect the taxes many evaded under the original Molasses Act. It also restricted foreign trade so as to spur economic growth in Britain. This was followed by the Stamp Act of 1765, which infuriated the colonists by requiring taxes on all paper products. As an internal tax, or one on items within a nation or colony, it even included products produced in America. Stamps on the paper proved the tax was paid. Intended to raise revenue to pay for British soldiers in the Americas, the new tax was met with riots and boycotts. (see Tree Of Liberty) The Act was repealed on March 17, 1766, but the desire to collect money from the colonists still burned in the hearts of the British. Additional taxes and regulations followed, which collectively became known as the Townshend Acts. There is not a pure consensus as to the precise acts included under the "Townshend Acts" heading, yet the most commonly mentioned are: the Revenue Act of 1767, the Indemnity Act (1767), the Commissioners of Customers Act (1767), the Vice Admiralty Court Act (1768), and the New York Restraining Act (1767). A more sought-after and long-term desired outcome of the Townshend Acts was to set a precedent that Britain had the right to tax and control the colonies as they see fit. The first of the Townshend Acts, the New York Restraining Act, was passed on June 15, 1767, specifically targeted to combat New York's resistance of the Quartering Act. This Act halted all New York Assembly and New York governor's ability to pass bills until they complied with the Quartering Act. In 1765, Parliament had passed the Quartering Act, which permitted British soldiers to impose on Americans, requiring them to provide housing, food, and other supplies at their own expense. New York, and other colonies, rejected the Act on two counts. First, with the French and Indian War over, colonists believed the necessity for soldiers was over. Second, it was viewed as another Act of taxation without representation. Believing the only issue with the Stamp Act was that it was internal, Charles Townshend, the chancellor of the Exchequer, proposed an external Revenue Act of 1767 to replace the Sugar Act. The new tax, sometimes called the Townshend Act, was attached to imported British goods and passed Parliament on June 29, 1767. Items affected were lead, paper, paint, glass and tea. 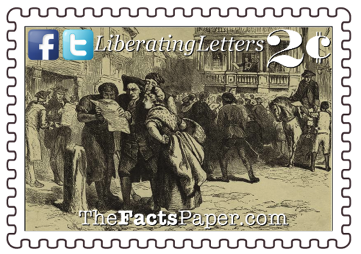 Though it did not receive the violent reaction the Stamp Act generated, Americans rejected them nonetheless. As a response to the Acts, colonists organized a non-importation agreement and eventually stopped importing British goods until the Acts were repealed. They also boycotted any imported products violating their agreement. Others fought back with a pen. Speaking for the Massachusetts House of Representatives, Founding Father Samuel Adams distributed a leaflet while John Dickinson wrote a series of essays called Letters from a Farmer in Pennsylvania discussing the British oppression. These documents supported the non-importation agreements and encouraged the public to continue them as they made an almost instantaneous effect on British trade. In compliance with the Commissioners of Customs Act, the American Customs Board was created and seated in Boston. Inspectors searched ships at will for possible smuggled items and to ensure duty was paid on cargo. However, smuggling was common and officials often looked the other way for a bribe, only recording partial cargo amounts. Colonists also supported smuggling as it kept prices on goods down. Well-known Boston merchant, John Hancock, made his fortune smuggling cargo on his sloop Liberty. Already a patriot, Hancock’s resistance to Britain was also known to the American Customs Board, which was determined to end smuggling. Therefore, when an inspector boarded the ship with allegations of smuggling, the captain locked him up until all the cargo was unloaded, then reported a small shipment in the log. The incident was kept quite for a month, until one man confessed on June 9, 1768. The next day, Liberty, was seized. The Sons of Liberty instigated a riot, forcing custom officials to flee to Castle William for safety. Hancock hired John Adams to represent him in what became a decidedly controversial trial. However, officials dropped the charges and returned Hancock’s ship, concerned he would appeal his ruling to officials in Britain, who would discover their bribery scheme. (see Tree Of Liberty) Nevertheless, this did not subside the restlessness among Bostonians. Britain sent soldiers to the port city of Boston to enforce the American Customs Board and try to control the riots. However, it only increased the tensions already coming to a boiling point. The lid blew off the pot on March 5, 1770, with the Boston Massacre. As news traveled extremely slow at the time, reports of the event did not reach Britain until weeks later. Ironically, on the same day as the massacre, Parliament met and began discussing repealing the Acts. Their author, Townshend, died shortly after they were approved and never saw the destruction of his actions. His successor, Lord Frederick North, proposed repealing all the Acts except the tea tax. Trying to save face with the colonists, North suggested keeping the tea duty. Instead, it just caused strife between merchants in the colonies needing the imports and colonial craftsmen benefitting from the non-importation agreement. - He has forbidden his Governors to pass Laws of immediate and pressing importance, unless suspended in their operation till his Assent should be obtained; and when so suspended, he has utterly neglected to attend to them. - He has dissolved Representative Houses repeatedly, for opposing with manly firmness his invasions on the rights of the people. - He has made Judges dependent on his Will alone, for the tenure of their offices, and the amount and payment of their salaries. Amendments III and IV of the Bill of Rights specifically address Britain's enforcement of laws allowing them to both search and seize property at will as well as the Quartering Act of soldiers. Liberty, Romans 13:1 tells us, “Let every person be subject to the governing authorities. For there is no authority except from God, and those that exist have been instituted by God.” Keeping this in mind, we should be slow, patient, and cautious about going against our government. Likewise, governments have a responsibility to God as well, whether they acknowledge it or not. The leaders of this country at the time before the Revolution spent years trying to work with the King, sending him countless petitions for redress of their objections. However, when it became inevitable that the king was removing God’s authority by his tyrannical ruling, a decision needed to be made. That being said, as we celebrate Holy Week, it is the most appropriate time to remember that Christ did not come to be an earthly king. We should always strive for truth, justice and equality. In some cases, that means in this sinful world we may have to take up arms against our fellow man. However, our focus and our hope remains in the cross where not only the victory is won, we can take comfort that the perfect king rules in his kingdom and is returning to take us to our heavenly home to live with him for eternity.